All ESA Annual Meeting proposal and abstract deadlines are 5:00 PM Eastern so that technical support and ESA staff assistance will be immediately available when submitters need it. If you begin your submission very close to the deadline, you are choosing to take a risk and we will not make an exception if you don’t complete your submission in time. The form automatically closes at 5:00 EST (2:00 PST) whether you have completed your submission or not. We invite proposals for special sessions for the 2018 ESA Annual Meeting. Special sessions complement the formal scientific program, providing an opportunity for presentations or extended dialogue and exchanges beyond what is usually possible in the regular scientific sessions. These sessions are not appropriate for the presentation of formal research talks and do not include presentation abstracts. Special sessions do not conform to any single structure. They may, for example, involve one presenter, a series of presenters, a panel, a film or video, an open-ended discussion, or some combination of these. Click here to see an example of a special session from a recent conference. To see other examples, please browse the online program from the 2017 Annual Meeting in Portland. Room set-up: Will you need a panel table? Food and beverage request: none, coffee, soda and water, snacks. Anticipated equipment needs: None, wireless internet connection, flip chart and easel. If there are any costs for running the proposed session (food, beverages, or equipment) What is the source of the funding? What expenses would it cover, and for what amount? Is there a session (formal scientific session, business meeting, or mixer) that this session is linked with? All special session rooms will be set for theater style (with or without a panel table). The standard A/V setup is a screen, LCD projector, and laptop (with sound). We anticipate that wireless internet will be available this year. Since wireless may not be available in all of the rooms we are using, it is important to specify at the proposal stage whether it is required so that we can plan accordingly. To promote diversity of sessions and topics, no person will be permitted to organize more than two workshops and/or special sessions at the 2018 Annual Meeting. A group of organizers may propose multiple linked sessions. Each session should be submitted separately and it should be made clear which other proposals it is linked to, as well as its intended order in the sequence of the events. To avoid conflicts with scientific sessions, special sessions are not scheduled concurrently with oral or poster sessions. All special sessions will be scheduled for Monday morning, 10:15-11:30 am. There will be no evening sessions as of 2018. We may offer some proposals a weekday lunchtime workshop slot to avoid scheduling conflicting special sessions with similar topics. Special sessions are open to all meeting attendees on a first-come, first-serve basis. Any costs for food, refreshments, or special equipment requested by the organizer will need to be covered by funding provided by the organizer. Meeting attendees may choose to participate in any special session without advance notice. Since there is no advance sign up, organizers will not know in advance how many people plan to attend. It is best to plan to accommodate a range of participant numbers. Acceptance of your proposal does not obligate ESA beyond providing a meeting space and including the session in the program. We especially stress that no ESA funds are available for waived or reduced meeting registration, honoraria, refreshments, special A/V needs, or travel expenses for session organizers or participants. All organizers and participants must register for the conference at the one day or full week rate. Organizers are responsible for making this clear to anyone they recruit to help with the session. ESA will not reimburse session organizers for expenses. Proposals for special sessions are reviewed and selected by the Program Chair in consultation with peers s/he may invite to assess proposals. Proposals may be from any area of science related to ecology, but those that pertain to the overall theme, “Extreme events, ecosystem resilience and human well-being” are especially encouraged. We also welcome proposals that explore connections with the social or natural sciences, or that are directed to ecological education at any level. Finalized information for all accepted special sessions will be available in the online program when registration opens (typically in early April). Once a special session has been accepted and listed online, cancellation imposes a serious burden. Do not submit a proposal if you are uncertain that you will be able to fulfill your obligation to organize and conduct the session. 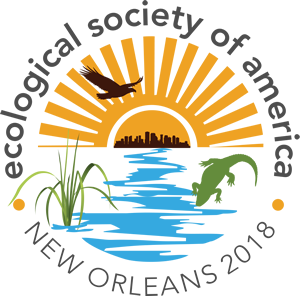 Once a session is accepted by the Program Chair, cancellation by the session organizer may preclude the acceptance of any sessions proposed by the organizer for the 2019 ESA Annual Meeting. Deadline for submitting a proposal to ESA. Notification of acceptance sent to organizer. Notification of scheduling (session date and time) sent to organizer.